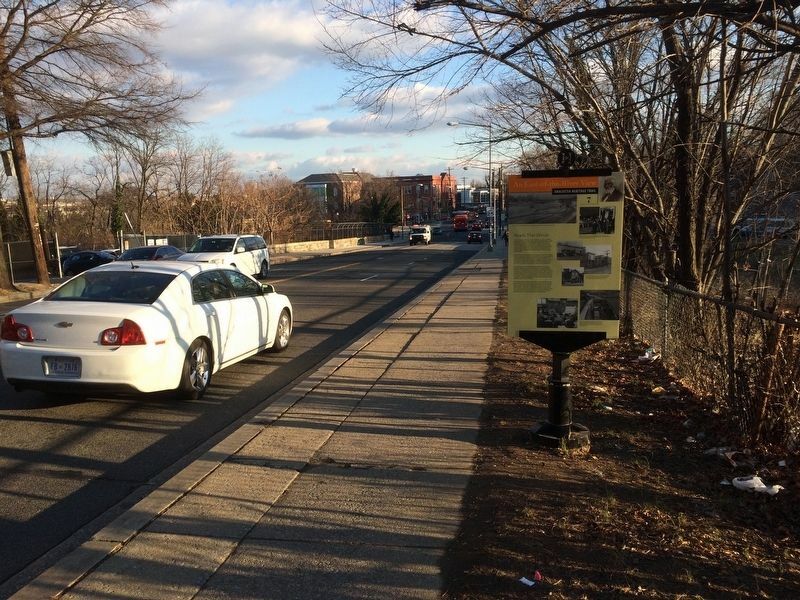 In the early evening of November 22, 1963, a clutch of people stood forlornly on this bridge spanning Suitland Parkway. They awaited the procession carrying the body of slain President John F. Kennedy from Andrews Air Force Base to Bethesda Naval Hospital, where it would be prepared for burial. Kennedy had been assassinated earlier that day in Dallas, Texas. The vehicles also carried his widow Jacqueline and newly sworn-in President Lyndon B. Johnson and his wife Lady Bird. Suitland Parkway had opened in 1944 to connect the new Camp Springs Army Air Base (later Andrews Air Force Base) and the Anacostia Naval Station and Bolling Field (later Joint Base Anacostia-Bolling). It also connected new federal office buildings in Suitland to downtown DC via the Frederick Douglass Memorial Bridge. To build the parkway, however, the U.S. government razed house and separated communities. values, and harm businesses. 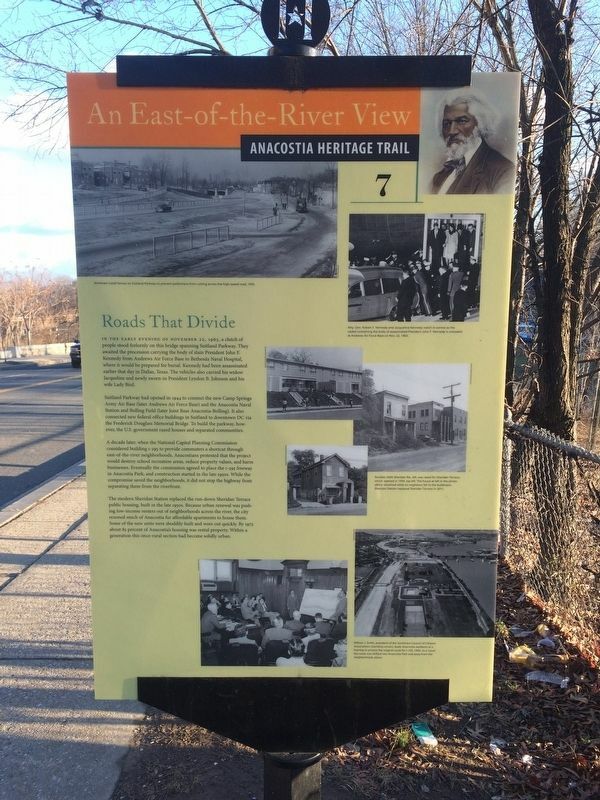 Eventually the commission agreed to place the I-295 freeway in Anacostia Park, and construction started in the late 1950s. While the compromise saved the neighborhoods, it did not stop the highway from separating them from the riverfront. The modern Sheridan Station replaced the run-down Sheridan Terrace public housing, built in the later 1950s. Because urban renewal was pushing low-income renters out of neighborhoods across the river, the city rezoned much of Anacostia for affordable apartments to house them. Some of the new units were shoddily built and wore out quickly. By 1975 about 85 percent of Anacostia's housing was rental property. Within a generation this once-rural section had become solidly urban. Marker series. 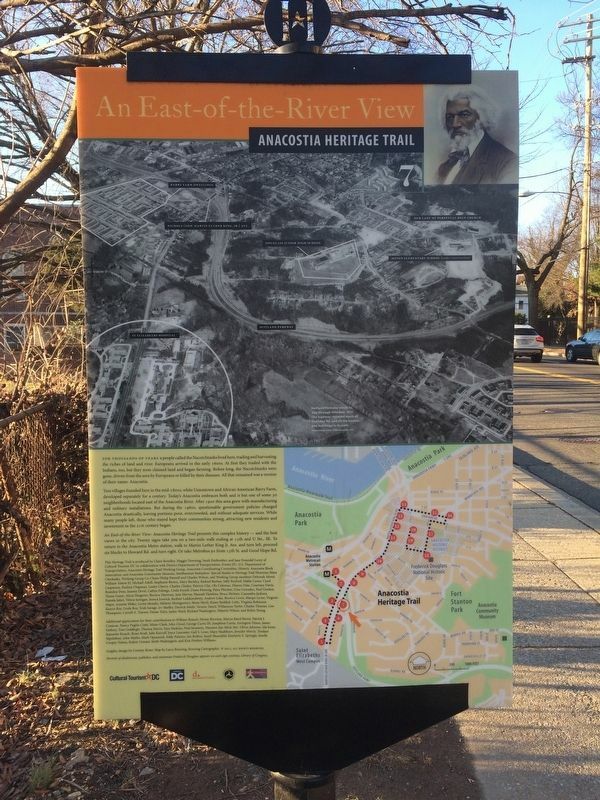 This marker is included in the Anacostia Heritage Trail marker series. Location. 38° 51.597′ N, 76° 59.678′ W. Marker is in Hillsdale, District of Columbia, in Washington. Marker is on Martin Luther King Jr. Avenue Southeast north of Stanton Road Southeast, on the right when traveling north. Touch for map. Marker is at or near this postal address: 2560 Martin Luther King Jr Ave SE, Washington DC 20020, United States of America. Touch for directions. (within shouting distance of this marker); Campbell African Methodist Episcopal Church (about 300 feet away, measured in a direct line); Faith and Action (about 500 feet away); Hillsdale (about 600 feet away); Grandpapa's Farm (about 800 feet away); A Navy Town (about 800 feet away); Barry Farm - Hillsdale (was approx. 0.2 miles away but has been reported missing. ); Birney School (approx. 0.2 miles away). More. Search the internet for Roads That Divide. Credits. This page was last revised on March 22, 2019. This page originally submitted on February 2, 2018, by Devry Becker Jones of Washington, District of Columbia. This page has been viewed 71 times since then and 13 times this year. Last updated on March 7, 2019, by Devry Becker Jones of Washington, District of Columbia. Photos: 1, 2, 3. submitted on February 2, 2018, by Devry Becker Jones of Washington, District of Columbia. • Bill Pfingsten was the editor who published this page.